12. Water temperature dictates when trout will feed and it should dictate when the angler will fish. 13. Water has its greatest density at 38 to 39 degrees and trout seldom hit when the water temperature is below 40 degrees. Frequently taking the water temperature tells you if it's rising or falling one degree. Thus I take the water temperature at least once every hour. If the temperature is slowly rising up to 63 degrees you will want to keep fishing. However, if the water temperature drops one degree the trout usually quit feeding. As you read further in the book you will understand the importance of this information. Having kept thirty-four years of water temperature data I have concluded there are three significant water temperatures at which trout seem to feed best. 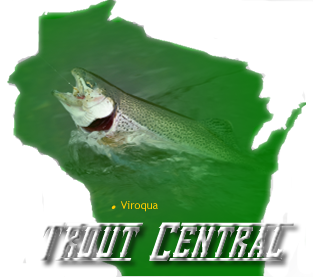 And, without fail the trout stream temperature will frequently range between those three significant temperatures during March, in Southwestern Wisconsin. I have identified the three significant feeding periods as the 40 degree rise, the 45 degree rise, and the 49 degree rise. What was most difficult was identifying why the feeding usually picked up at 40, 45, and 49 degrees. It took more research and the application of science to figure that out. A trout doesn't have an eyelid and can't dilate the pupil - it must seek shade. Don't assume that four-inch wide strip of open water between the weed growth and the bank is too small for a feeding lane. Pop your lure in there and be ready for anything.